Unless you’ve been living under a rock this past weekend, you would know who Nathan Hartono is and what exactly he’s accomplished. For those who have no clue who he is, Nathan Hartono, a local born talent won first runner up in popular singing reality show Sing! China (the furthest any Singaporean has placed!). Not only did this local singer start a Milo craze which resulted in milo trucks making an appearance at Plaza Singapura, he also gave this popular local dish a special shoutout, BAK CHOR MEE! Bak Chor Mee is the quintessential comfort food, not only can you find it in every other coffeeshop, you can have it in so many different ways! Here at DSG, we’re always on the hunt for the best foods and that (of course) includes Bak Chor Mee. Here are the top 6 places where you (and Nathan Hartono) can satisfy those Bak Chor Mee cravings! By far the most popular Bak Chor Mee spot in the whole of Singapore, queues at this famous eatery can take up to 2 hours! The Bak Chor Mee here is known to have the perfect balance of sour and savoury from the blend of vinegar, seasoning and its rich tasting sauce. If you’re looking for a quick lunch this might not the place for you but if you’re craving for some legit BCM on a lazy day Hill Street Tai Hwa Pork Noodle is your best bet! If you’re living around Bishan and Toa Payoh, you’re in luck because there’s a popular Bak Chor Mee spot a stone’s throw away. 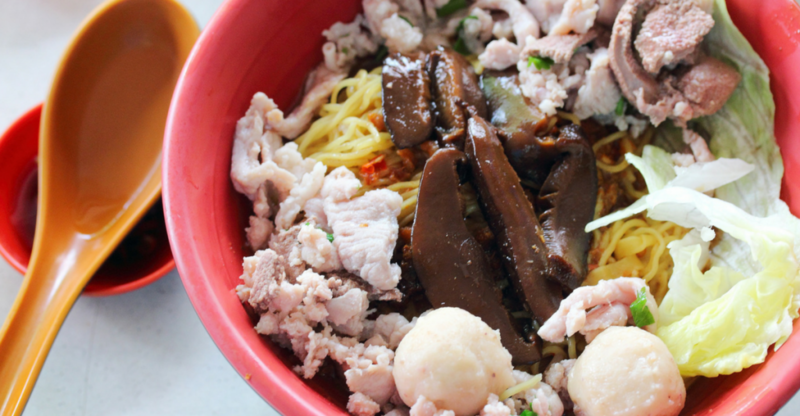 Lai Heng Mushroom Minced Meat Mee offers up Back Chor Mee that takes nearly an hour. The noodles are surprisingly springy and the stewed mushrooms add a new dimension to this classic dish. A must try for anyone living in the area! This Bak Chor Mee spot serves up the “dry version” of the popular local dish. The highlights of 58 Minced Meat Noodles? The generous serving of lard and the sweet-savoury chilli sauce that compliments the Bak Chor Mee. If you’re watching your weight, you’re better off eating something else. But if you’re looking to indulge in a bowl of BCM this is the perfect spot for you! A popular haunt for Bak Chor Mee enthusiasts, Ah Hoe Mee Pok serves up BCM with noodles that are a lot more springy than other outlets. So if you prefer your noodles chewy, this is a good spot for you! Looking to make your traditional BCM a little bit more atas? Ah Hoe Mee Pok serves up Bak Chor Mee with crayfish! Don’t be fooled into thinking this Bak Chor Mee spot has no queue, they have a queue number system so be prepared to wait up to an hour for a bowl here. Dishes at Macpherson Minced Meat Noodles are prepared individually and are crafted with springy noodles and stripes of braised pork belly and crispy lard. While the dish is amazing on its own get it with soup on the side, the rich pork broth is the perfect compliment to this popular local dish. One of the more unique Bak Chor Mee spots, Seng Huat Eating House offers their own twist on the classic dish, tomato sauce! While Bak Chor Mee purists may never step into this BCM spot, the tomato sauce actually adds a unique twist. Another highlight of their Bak Chor Mee is the mushrooms which balances the taste of the entire dish without overwhelming it! Also Read: 6 DIE DIE Must Visit Stalls For Lovers Of Seafood White Bee Hoon!